Teaching is about letting the student become the master. In my case, I feel that if I can just get students to *think* a certain way about aerial, then the whole world will open where they will no longer desire classes to teach just skills. They will hunger after classes as a means of communal research, training, fun and exploration, and not at all about teaching trick, trick, trick, trick. Aerial is about something much more fun and exciting — it’s about creating and exploring! And this is why I teach using the methods of aerial taxonomy. The “tricks* I teach are the classics, the basics, the standards. The fun part is the layering, the discovering of the millions of ways to manipulate and weave in between the classics. It’s not fun to go steal how someone on Instagram weaved and twisted and turned. It may be inspiring to see that things can be done a different way, but it could also be done YOUR way if you took the time to research. There are enough variations for us ALL to have our own unique pathways, threads and weaves in and around our apparatuses. Stop being someone else. That’s what this is about. Let’s start teaching the TOOLS to create and each be pioneers of the art form. The following is from a workshop I give called “Aerial Taxonomy 101,” but I’ve recently started incorporating the language into everything I do. You will start to see classifications of this sort in each of my upcoming books, starting with the Aerial Sling Manual Volume 2, which will be out by the end of 2019. These are all important terms to know and understand in the science of classifying aerial skills. If we are drawing the analogy to the animal kingdom, then skills are your animals. Our job in aerial taxonomy is to classify and put each skill into categories, drawing out the underlying similarities between apparatuses, etc. Each skill can be defined by four elements: (1) the underlying base position(s) you are in, (2) what actions got you into your skill, (3) what shape you are in and (4) what apparatus you are on. Base positions are the skills which grow other skills. The branches from which the leaves emerge. Base positions can vary from studio to studio, but the overlapping Venn diagram would include skills that everyone can agree are “must-knows” on each apparatus. For example, a footlock on silks is a classic base position, as is catcher’s (aka open thigh wrap), s-wrap, hip key, etc. These are skills that everyone can agree on that every aerial fabric student should know. Each are independent of one another and help build the rest of the vocabulary. 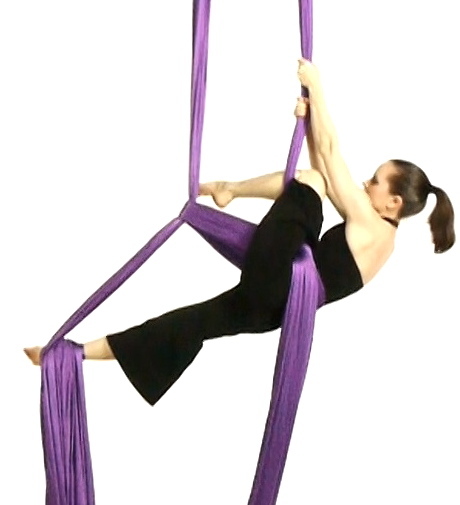 Skills such as crossback straddle would not necessarily be considered a base position for the sake of aerial taxonomy, but rather a combination of base positions. Crossback straddle is a combination of the base position of crossback and footlocks. These are a subset of base positions. I won’t go into this in detail here, but root positions are helpful when you are trying to boil down all base positions into as few elements as possible. Root positions can be thought of as the tree trunk which grows the base positions, which are the branches; which grow the leaves, which are the skills. More on this in my workshop. Shapes help describe the orientation of the body while in a particular skill. 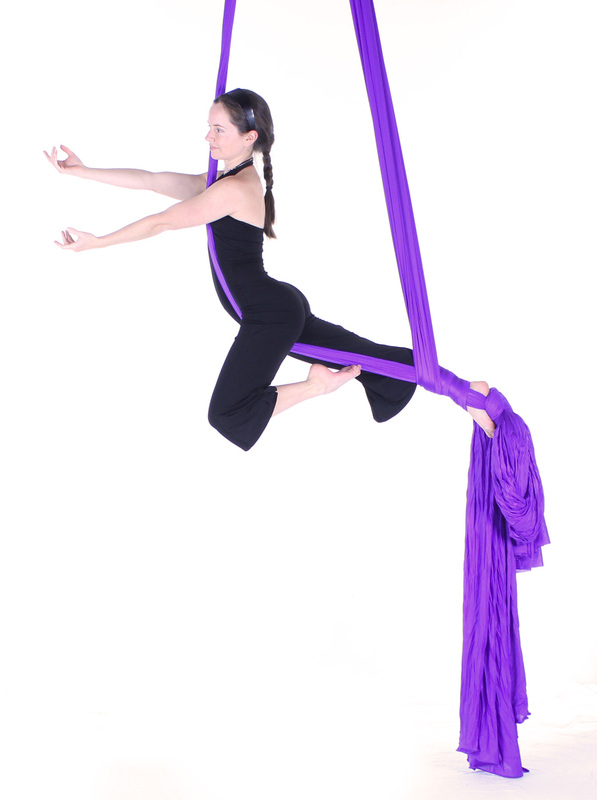 For example, I could be inverted under a hoop (a base position) and make a wide variety of shapes. I could be in a meathook, a straddle, a pike, a ball, the splits, etc. None of these really affect my location in terms of my contact with the apparatus, but they can affect my tilt, orientation, and general look of the skill. Actions are the transitions of aerial. They tell us how we got from the trunk to the branch to the leaf. Did we walk, run, skip or crawl? I have placed these in “classes” in order to study them more in-depth as categories. For example, my favorite action class is knee hooks. On any vertical apparatus, you typically have six classic knee hook options: (1) same-side regular, (2) opposite-side regular, (3) inside reverse knee hook, (4) outside reverse knee hook, (5) inside 2-knee hook, and (6) outside 2-knee hook. This category is pretty straight-forward. However, I do want to note that often times, I will use terms like “We are in silks-land now” even though we are working on a sling. For example, if you climb up high enough and put on footlocks above you, you are really in “sling-land” anymore. That’s a fabric skill that is being placed on sling. So, sometimes the apparatus where the base position is rooted is different than the apparatus where the skill is being applied. Let it be understood, that even though I don’t study footlocks as a base position in sling, I am never opposed to using them there. That is part of the fun, the exploration and the creativity. It’s one thing to classify the classics. It’s another to start breaking all the rules. My aerial taxonomy goes more in-depth than this introduction here, but I hope that this gives you a good overview for understanding my categories of study. Like I mentioned above, you can expect to see these classifications come more to the fore-front of coming manuals as I work to create a universal language and curriculum for the aerial arts. I hope to maintain great consistency across all the aerial apparatuses, and provide the study of each apparatus that highlights the unique properties of each, allowing you to cross-train and break all the rules as you may. I’ve been on an “Aerial Theory” kick lately and so you are getting some of my thoughts through this current blog series. In my last blog, I coined a term = Aerial Taxonomy. Just like biologists are concerned with classifying animals into kingdom, order, phylum, etc, it’s time aerialists got more organized with their classification system for aerial skill sets. This blog is concerned with why you should care. My next blog will be concerned with a set of guidelines that I follow when setting scientific-aerial names. Aerial Taxonomy = The branch of science concerned with classification of aerial moves. 1. Having clear aerial taxonomy helps to classify aerial skills. Well, this is the definition. Yes. 2. It helps to speak a similar language within the community. If we can hit the more descriptive names when we cross-reference and cross-train, this can help us communicate more effectively across the professional aerial industry. When students move and pick up training at another gym, it is helpful to have similar names from place to place, at minimum for the basics of aerial. 3. It helps to raise the professional aerial community to higher standards. When teachers get together and talk teacher-talk, it is extremely helpful to have proper names rather than say “I teach the purple bomb, then the sparkling twirl, etc.” Even if your local vernacular differs from the scientific name, anyone who seeks to be a professional aerial educator should learn the scientific names to be able to communicate among other professionals. This is analogous to calling a cat a “cat” versus “felis catus.” There’s a time and a place for both. 4. It helps to understand the connections between moves. The more that you can abstract the concept behind the skill, the more you are able to see how skills across the board relate with one another, both in technique and through transitional pathways. You can then use conceptual connections when exploring unfamiliar territory and you can use transitional connections to enter and exit skills in interesting and unique ways for choreography. If you have studied rope or silks for any length of time, you are starting to see how vital hitches are to your understanding of wraps. They pop up everywhere and do so many things! It’s helpful to have a consistent naming system for all these hitches (more next blog). To give another example of this-> I have a skill on sling that I have named the “hip corset.” It is where the sling crosses behind your back and tightens around your hips. This very same wrap can also be put on the thigh. In that case, I am using the term “knee corset.” By using the term “corset” in both places, I am helping to highlight the similarities between the wraps. This can help students to see the underlying concepts as well. I will be writing more on this in the next blog. 5. It helps you to read new moves faster. When I watch moves that go around on social media, or — most useful of all — when I’m watching my students during their learning process, I can immediately tell what they are doing and why things are working the way the are (or not working the way they are supposed to). 6. It helps you to uncover and discover uncharted territory. This is the number one reason I am an Aerial Taxonomist/Researcher/Aerial Scientist & Classifier —> It gives you a systematic way to organize skills and thus you can find ones that are hiding just beneath the surface but no one has found yet! This is my favorite part. Even if they are things that have been done, seeing a new way to do an old thing or see a connection to another puzzle piece is fascinating. I’ve included a video below so that you can see my brain in action. In this video, I go from a pedal press arabesque into an arabesque with silks together into a hip-blocked skater, into half-catchers and finally into catcher’s. It’s all in the family of half-catcher’s. By seeing that the wrap on the leg was a “catcher’s-crossing” I could see the transition was possible. The theory lies in the language that we use. I will write more on this topic in my next blog. Thanks for reading. PS: Remember, if you like this kind of thing, we have almost 1,000 videos now in our video library that spans sling, silks, trapeze, hoop and rope!!! Sign up for a paying membership to view the whole library!! It struck me–I do it constantly and talk about it and feel it and sense it, but I don’t have a ready definition. So I decided to write a blog about it to try and sort out my thoughts. I’m also hoping that I might get some responses below. How would YOU summarize aerial theory? It’s a tough question. First, I’ll start with some history that led me to start thinking about theory in the first place. I was a math major in college. In college, math classes and even departments are typically divided into the pure math side and the applied mathematics side. Applied mathematicians are very practical, out there in the world as engineers, physicists, etc. We appreciate all their contributions of getting us to the moon, helping us to encode computers, etc. Pure mathematicians are typically employed in academia as a career. Or they go on to use their math in more subtle ways (like me). To me, math is more of a way of thinking, of problem solving, a philosophy or a way of looking at the world. The dividing class for many budding mathematicians is a class entitled Methods of Proof (or something similar depending on the college). In that class, you discover if you can really hack it as a pure mathematician. It’s when math turns into something else. You learn a new way of thinking. If you have a theory, prove it. If you think two equations are really the same thing stated in different ways, prove it. If you see a connection between A and B, show me. Fast forward 5 years. I find myself working with the aerial fabric for the first time and feel my mathematical neurological pathways firing in my brain. I see how A and B might be connected. I must get up on the fabric and find a connection to prove it. I think you are in the same wrap just rotated another direction, and I’m going to show you so that you will be convinced. Sometimes I feel completely helpless when putting together an actual performance piece (although I am growing in this area as the years go on). I enjoy staying in my head about which wrap equals what other wrap and how else can you get there? Yes, I know I already know 100 ways. What is way 101? Are they all distinct? At what point is it considered a distinct entry? How do we start to count them all to know that we got them all? What’s the best way to order this chaos? This is fascinating to analyze. And for some reason, it never gets old. It only gets more interesting the more that I know. Pure mathematicians love to analyze. They don’t mind working in the abstract and they are patient with problem solving. It could take years for something to unravel and reveal itself. That’s the beauty of it. But I suspect there’s a better way to define it. Thoughts? I’d love to hear from you! If you’re shy about posting publicly, feel free to e-mail your thoughts to me at info@aerialdancing.com. Thanks. PS: Look for a follow-up blog where I write more of my conclusions regarding aerial theory.